Compared to other big American cities, we’ve always been pretty spoiled with square footage out here in Los Angeles. 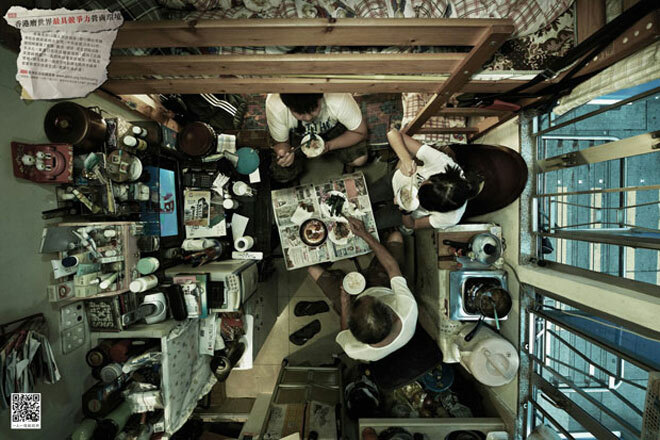 But if you ever feel like your place is too small, take a look at these images from Hong Kong. Your 700-square-foot apartment will feel palatial. These images of cramped spaces were commissioned by the Society for Community Organization. I don’t know who shot them but find them really compelling. How the hell did the photographer shoot these? Was he strapped to the ceiling? I can’t say I’ve seen anything quite like these intimate pictures showing how people live in tiny spaces with creativity and dignity.